Ultra Mass Xtreme is the weight gainer that gives you the most bang for your buck. A calorie bomb to build your body in record time. Stacker2 Europe has two gainers in its product range. 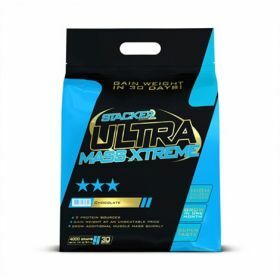 GIANT Mass Gainer was developed for the advanced athlete, while Ultra Mass Xtreme is developed for the beginning strength athlete who is looking for a top product for a reasonable price to build muscle mass for a full month. We consider Ultra Mass Xtreme to be the weight gainer with the best price/quality ratio.